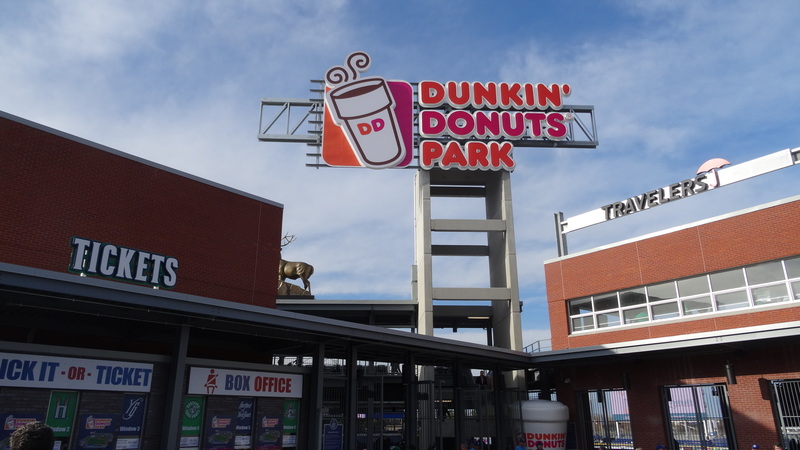 With almost 49,000 voters weighing in on the top Double-A facilities, Dunkin’ Donuts Park, home of the Hartford Yard Goats, was the winner in the third-annual Best of the Ballparks fan vote from Ballpark Digest. Fans selected Dunkin’ Donuts Park over Peoples Natural Gas Field, home of the Altoona Curve, in a bracketed online competition at ballparkdigest.com that saw over 178,000 fans vote on their favorite MiLB ballparks. On opening night, however, the focus shifted to baseball, something that was welcomed by the crowd of 6,850. The night ultimately gave the Yard Goats a chance to showcase Dunkin’ Donuts Park, which made a strong impression in its debut. Like many of the ballparks that are being constructed today, Dunkin’ Donuts Park welcomes the social aspect of attending a game, something that is reflected in the seating choices available to fans. The ballpark contains numerous options for spectators who want to wander and take in multiple angles, and these spaces provided some excellent perspectives on the action. The Yard Goats have played in front of capacity crowds 15 times. This past weekend, 19,956 fans watched the Yard Goats in Hartford. Dunkin’ Donuts Park has been sold out completely in each of the last three weekends (Friday through Sunday) and filled to capacity in 11 of the past 17 home games.